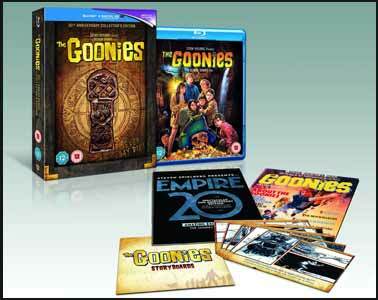 I'm old enough to remember going to the cinemas in 1985 to see The Goonies. I was 15-year-old at the time and, along with my friends, thoroughly enjoyed it. it was a movie about kids, like us, who took matters into their own hands and went on an adventure. It had pirates, action and adventure and a lot of humour. Now, while I did rent the movie on VHS video many years ago and have seen it when it's been broadcast on TV, I think the last time I saw it was in the late '90s. So when this Blu-ray edition turned up in the post for review, I wondered if it would have aged as well as I was hoping. A friend recently told us that The Goonies was his favourite movie - despite the fact he wasn't born until after the movie came out. Yes, that makes me feel old. It's still a good family film and in an age when bland super hero movies are all the rage, films like The Goonies bring us back down to Earth a little. It's aged quite well too. It's probably not the same for kid's of today, but this movie was probably embraced more by our generation because those of us born in the '70s and '80s went on bike rides with their friends and always wished that some bizarre adventure would unfold? "So, what's so special about this 30th anniversary edition that I need to shell out more money?" I hear you ask. To be perfectly frank, the truth is... nothing much. The audio commentary dates back to the 2001 DVD release. You get only a few extras, which I'm guessing were available on previous releases, and some extra merchandise in the box (but nothing that exciting). In fact, a quick trawl over the Internet indicates that everything here (and more) has been available on earlier USA editions. In fact the extras on the disc all come from the 2001 DVD release. On the disc you get Commentary (with hidden video treasures) by director Richard Donner, and all the original child cast members (I suggest you ignore the first commentary and go for the hidden video treasures commentary. They are both the same as far as the audio content, but on the video option, every now and then, shows us the cast recording the commentary so you can see what they looked like when the commentary was made); The Making of The Goonies (6 min, 49 sec original '80s making of featurette); Deleted Scenes (6 min, 49 sec which includes the octopus sequence); The Goonies ‘R’ Good Enough Music Video (12 min, 04 sec); and Theatrical Trailer (2 min, 41 sec). In addition the film's audio track has been remastered in Dolby TrueHD 5.1. It wasn't an issue for me (as the last time I saw it was through the speakers of a TV set) but the sound quality on previous releases has been a little problematic. The surround sound on this release sounds fine though. Jeff Cohen was still suffering from Chicken Pox during Chunk's infamous Truffle Shuffle; the cast laughing at how the close up shots of their hands were actually the hands of a 45 year-old man; that there was an octopi and gorilla in the original cut of the movie; The pirate ship set was one of the biggest made at the time and the cast weren't allowed to see it until the day of shooting in order to get their surprised reactions (although Corey Feldman admits he did see it earlier); The casts love of the late Anne Ramsey ("Mama" Fratelli); and pointing out that Stef just seems to vanish in the closing scenes of the movie. For those of you that wanted to hear the end of Astin's Cyndi Lauper story, a quick Internet search will turn this up. Back when they were filming the music video the kids were all tired and grumpy and that was because it was at the end of a long day of filming. They loved the song and Astin felt that Lauper was upset with them for not being as energetic as they should have been. He just wanted to publicly apologise on behalf of all the kids. You also get some merchandise in the box. These include Art Cards; a 1985 Making of mini magazine; and Empire’s Cast – Where Are They Now mini magazine. The packaging leaves a lot to be desired. Firstly we get a cardboard box which I assume is the same box that houses the DVD release... However, so as to save costs on the packaging a sheet has been glued onto the back (which contains exactly the same information as is printed on the box) and a tab is badly fixed over the front of the box to display the fact this is the Blu-ray release. The next problem is getting into the damn thing. Whoever designed this box must hate collectors and those that want to keep their purchases in pristine condition, because it's almost impossible to open and reclose it without taking a master's class in origami. In addition, even though our Blu-ray came shrinkwrapped, the Empire’s Cast - Where Are They Now mini magazine was nowhere to be seen. I checked with the PR company and this is supposed to be included... so I could just be the one unlucky individual who got a wrongly packed box. I actually found the 1985 Making of... mini magazine to be quite informative and well put together. There are also 10 art cards. Half of these show original storyboard illustrations on one side and the finished shots from the movie on the other, whilst the other 5 show storyboards for deleted scenes. These include the octopus scene and the gorilla scene. I still have a special place in my heart for this movie, and it's still an enjoyable family film... 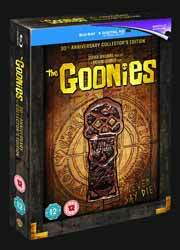 I just don't know if it's worth spending £30 when you can pick up the 2010 Blu-ray release online for under £15. The movie gets a good 9/10, but this release is a little too expensive. In fact if you're not overly bothered about having the remastered audio and Blu-ray picture quality, you're probably best advised to pick up the 2001 DVD release - which you can pick up brand new for £5 on Amazon.